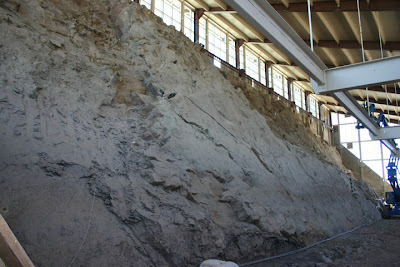 Well the sarcophagus is finally down and the quarry completely exposed once again. 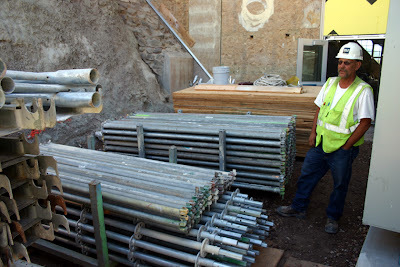 The scaffolding and plywood are stacked outside and being loaded onto trucks. 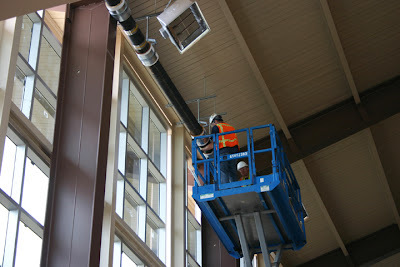 The crane and basket used to put it up and take it down has left the building for the last time. This is a momentous event but I'll just let these photos do the talking. 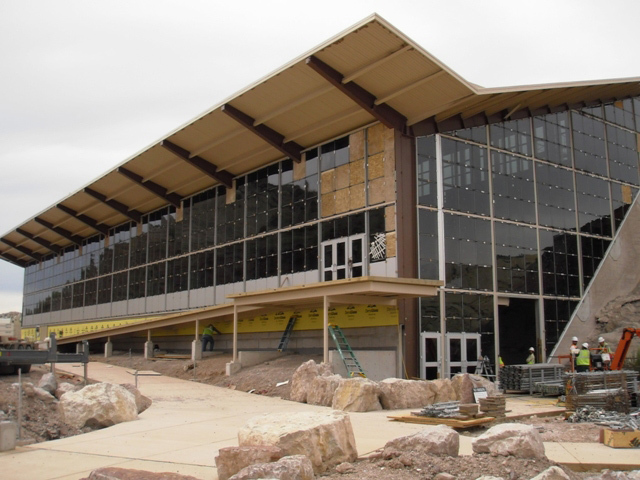 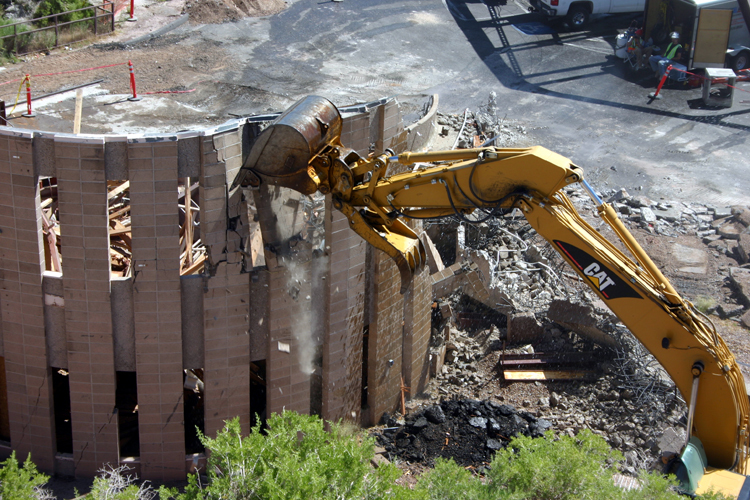 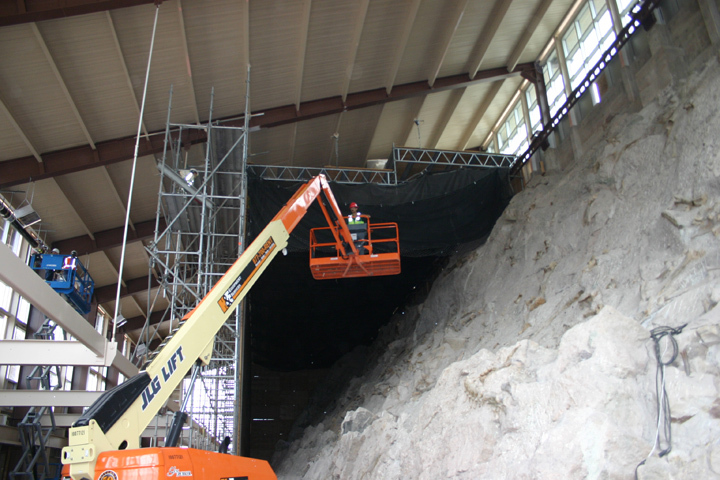 Last year we saw the demolition and removal of the rotunda and ophidian entrance ramp leading up to the second floor of the glass enclosure around the Carnegie Quarry. 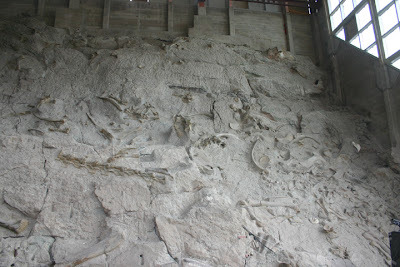 Those features will not be replaced but we wanted to retain the dramatic experience of entering the building and suddenly seeing, all at once, the entire sandstone face and its 1500 dinosaur bones. 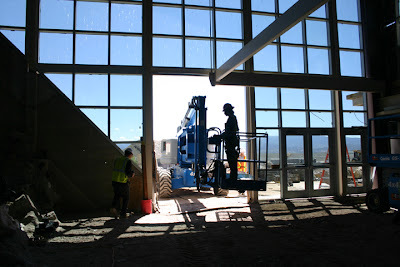 So the second floor entrance has been retained but will be accomplished in a different way. 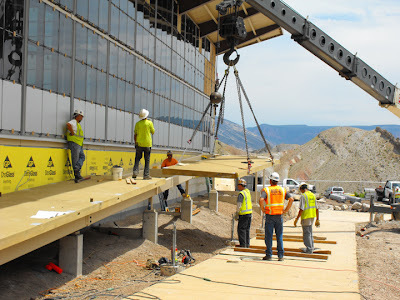 A wide sidewalk will lead visitors to the far west end of the building where they will then go up a 150 foot long ramp that rises from ground level to the second floor at the east end of the building. 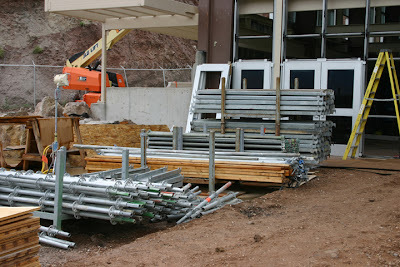 The sidewalk and steel framework for the ramp has been in place for some time. 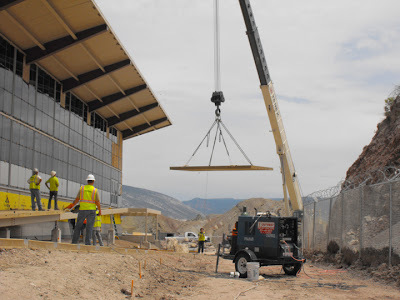 We recently completed this project by putting in precast concrete slabs. 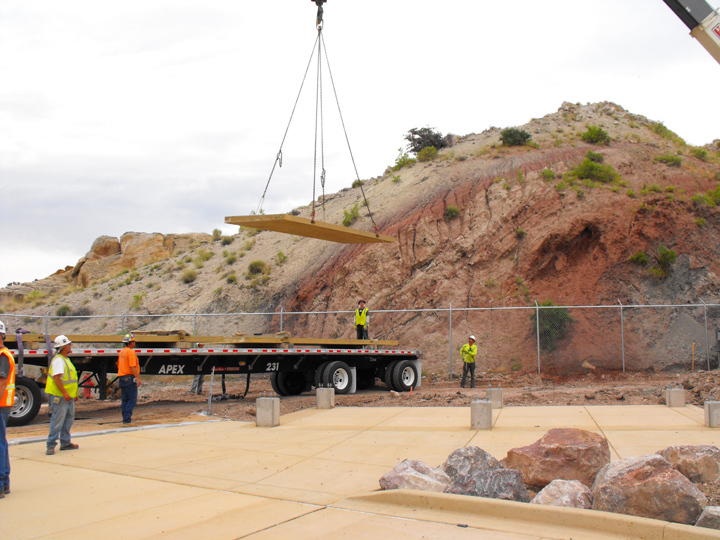 The slabs weighed between 10,000 - 20,000 pounds apiece, so this was a task requiring both heavy equipment and a delicate touch. 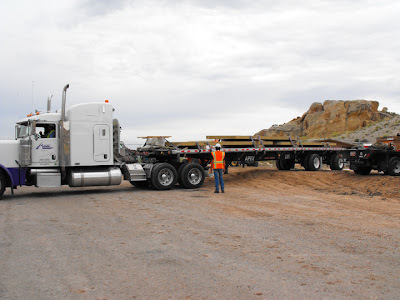 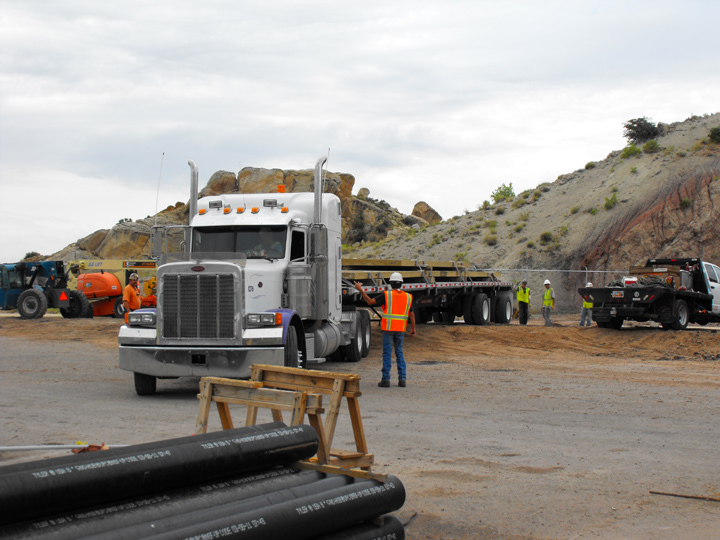 The slabs arrived on a number of flatbed trucks with several slabs on each. 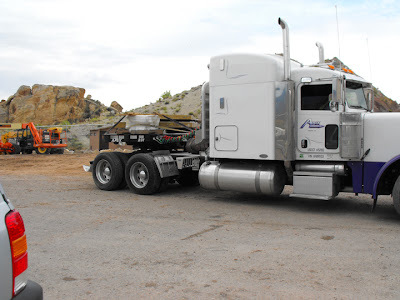 They were made near Tooele Utah, some 200+ miles and several mountain passes away. After getting the slabs to the QVC the first challenge was to turn the flatbed around and back it into a narrow space on the south side of the building, between the newly installed bathrooms and the sidewalks. This is no mean task because with all the various projects currently underway at the Quarry, the parking lot is crowded and space is at a premium. So this was a tricky bit of driving. 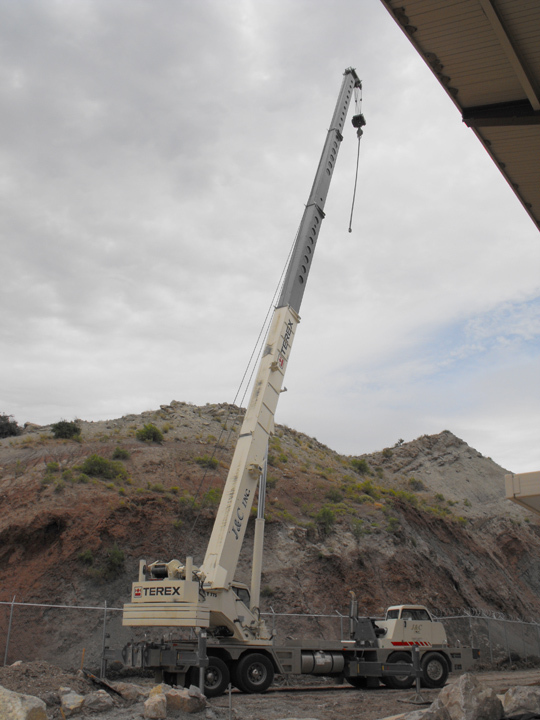 Once the truck was in place a large crane, with a lifting capacity of 70,000+ pounds, swung its arm over the trucks. 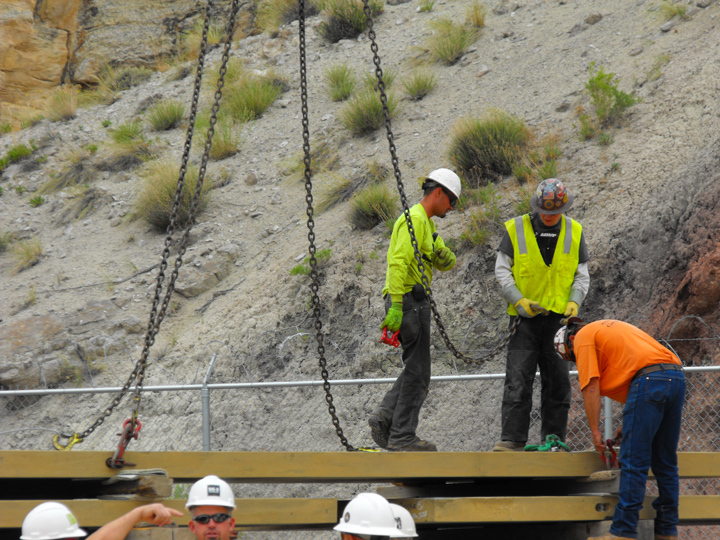 Chains at the end of the crane’s cable were attached to the four corners of each slab. 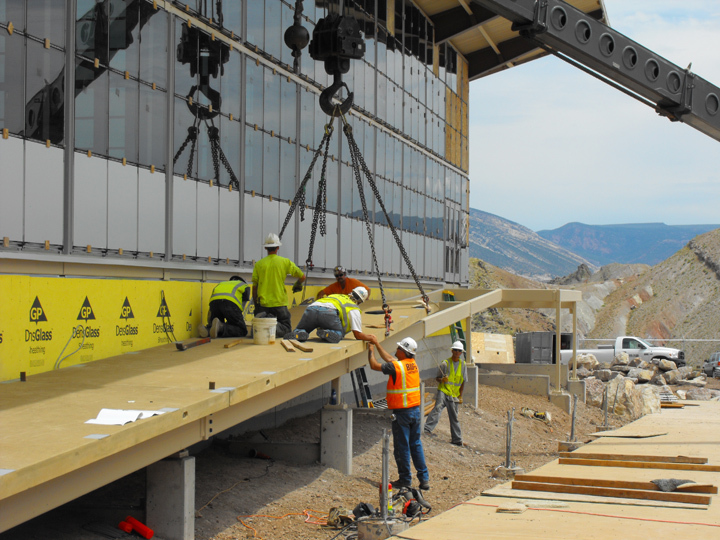 Once in place, each slab was lifted up and swung northwards to the ramp framework. Then the slab was gently swung over the framework then slowly lowered, pushed, and guided into place. 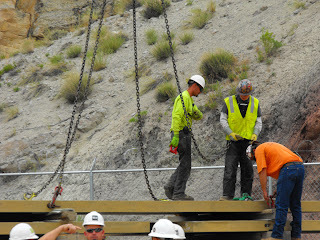 Once the slab was in in place the chains were detached and the arm swung back to the get the next slab. 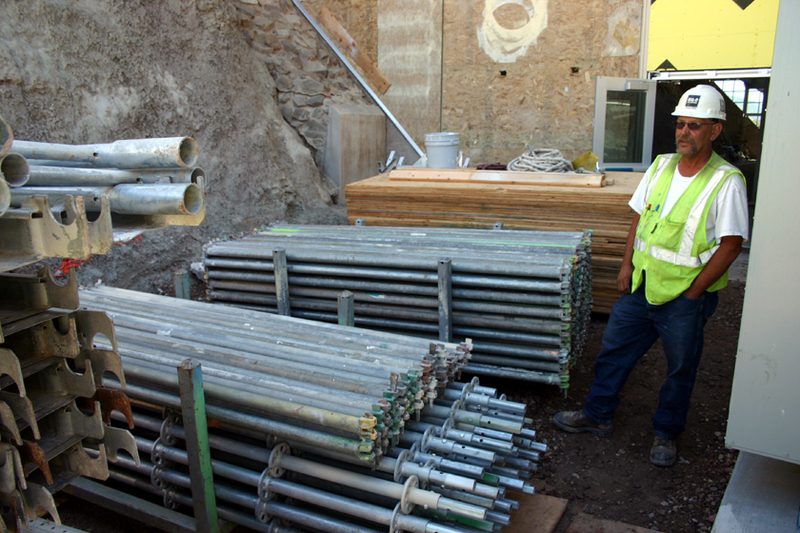 Metal connectors built into each slab are then welded to the steel framework. 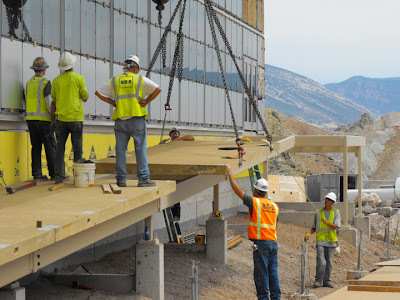 Eventually all the slabs were in-place and attached. The double doors have been installed where the ramp joins the building. 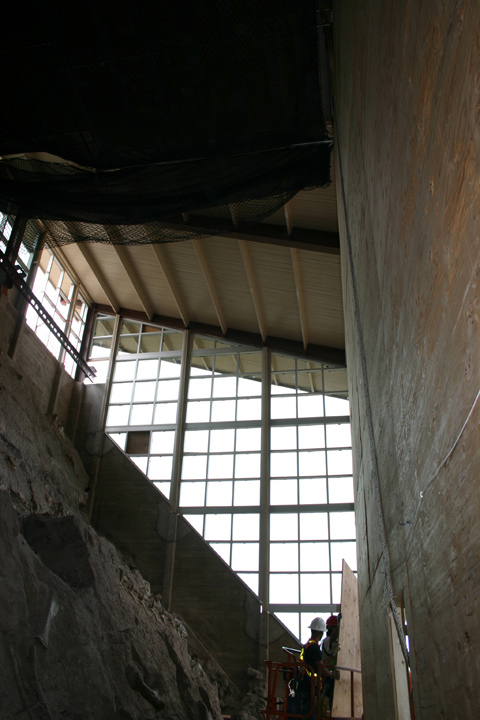 In a few months they will be swung open to let visitors once again gaze upon the Jurassic rocks and bones of the Carnegie Quarry. 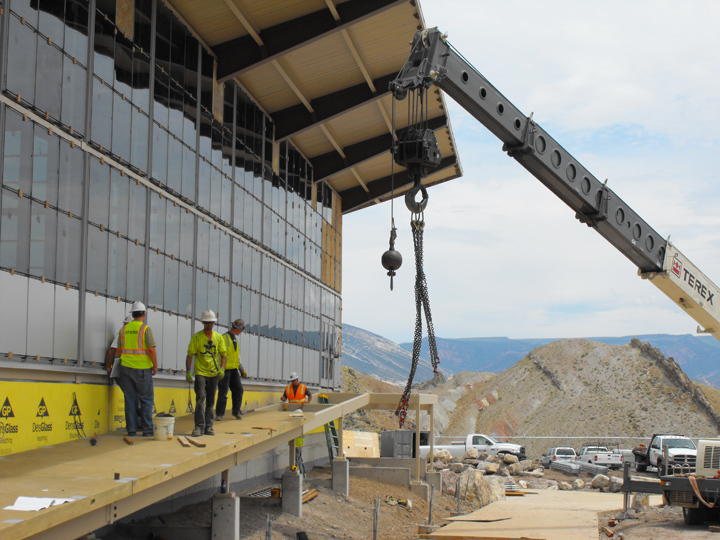 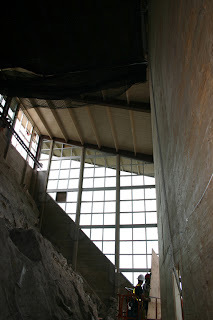 The gull wing roof is one of the architectural signatures of the Quarry Visitor Center. It’s pretty spectacular but poses some problems that might not be obvious. 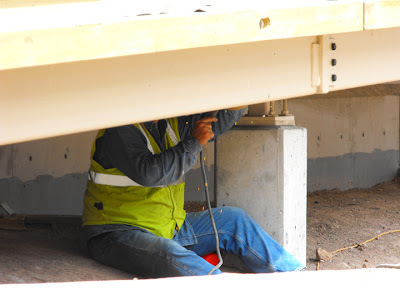 Unlike your home, water from melting snow and summer thunderstorm toad floaters does not run to the edge of the roof and off the side down rain gutters and drain pipes. Instead it runs to the bottom of the V of the gull wing and down a drain at the center of the roof, into horizontal pipes near the ceiling, and down into a drain system that carried it away from the building. Remember that many of the problems of the old QVC were related to the expansive soil beneath it getting wet. 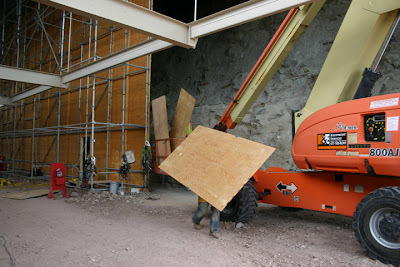 So getting the water on the roof away from the building is critical. While the sarcophagus is being dismantled work goes on nearby inside the building assembling the new roof drainage piping system. Given that much of this is 40 feet above the ground, the new piping is installed, anchored and connected primarily working on a scissor lift. Well the day of joy has finally arrived! 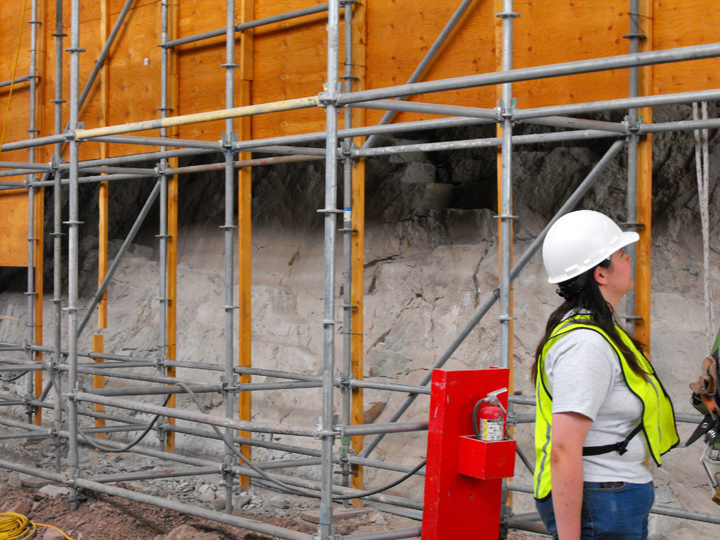 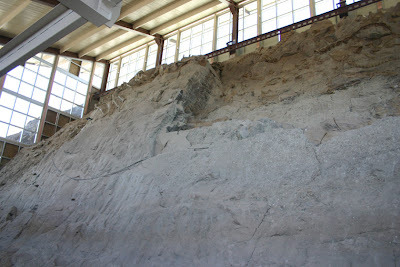 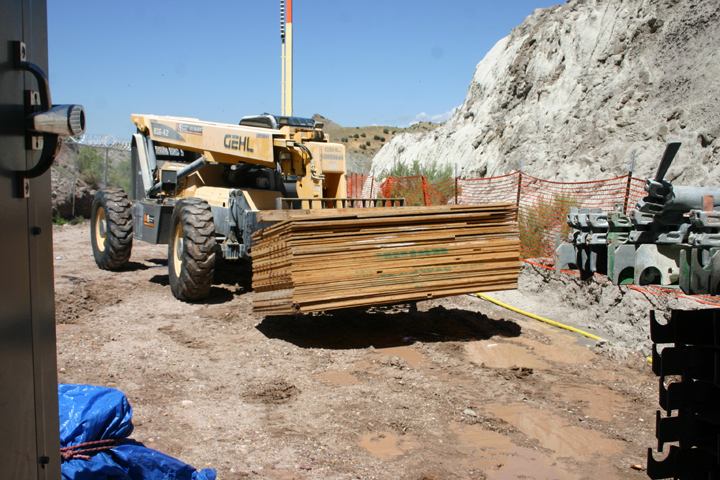 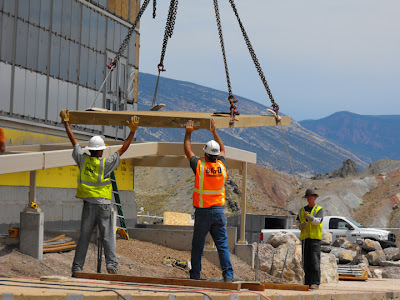 Just before the long 4th of July weekend crews began to take down the plywood sarcophagus which has hidden the quarry sandstone and its treasure of dinosaur bones for so long. In one sense this is just a simple reversal of how the sarcophagus and its scaffolding framework was erected. 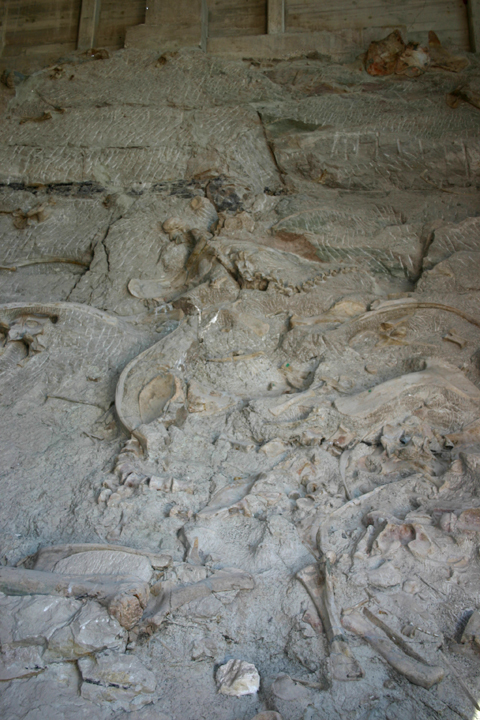 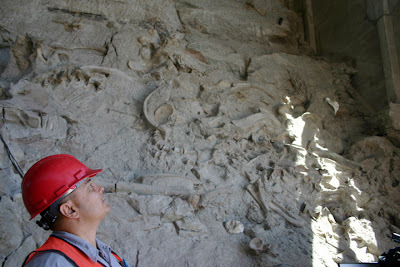 However, this is fraught with just as many dangers for the fossils as when it was put up. 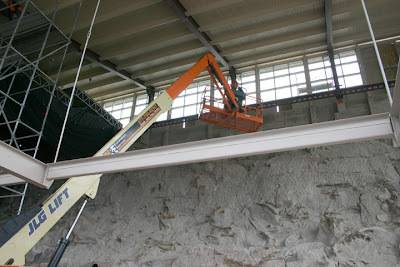 Each sheet of plywood, each pipe and connector of the scaffolding, each layer of netting, fireproof blanketing, foam padding, etc. has to come off without being dropped. 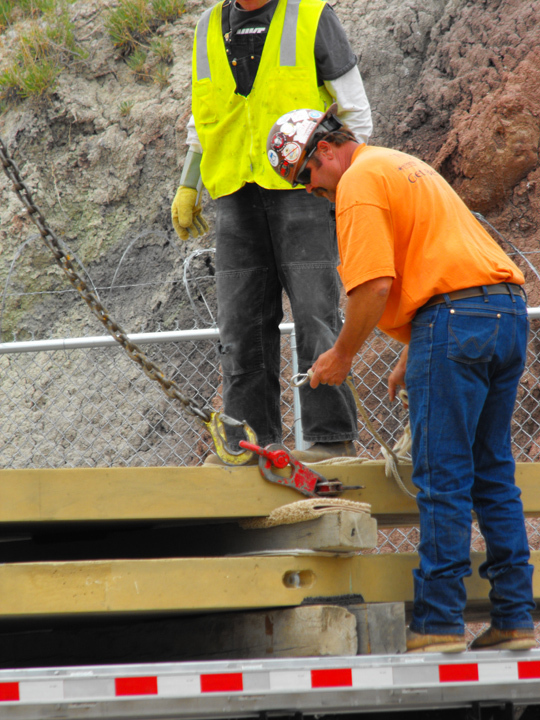 Some work rules will reduce the danger. Each tool is on a lanyard so that it won’t go to the ground (or fossil face) if dropped. 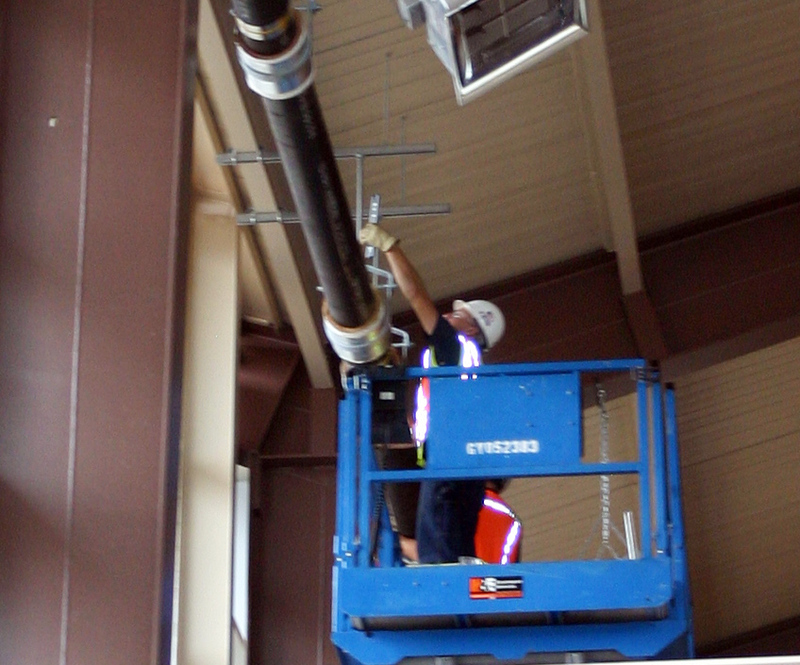 Every piece of pipe is held with two hands as it passed from one person to another. Each piece of plywood is hooked to a cable and lowered to the ground or into a basket on the end of a crane. As the parts are taken off they are stored outside in the parking lot. 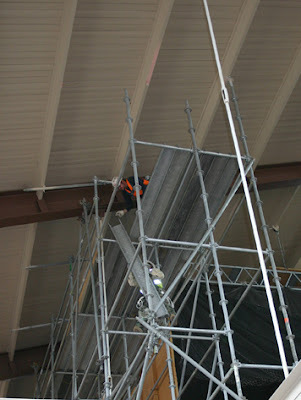 Some work is done on the scaffolding itself. 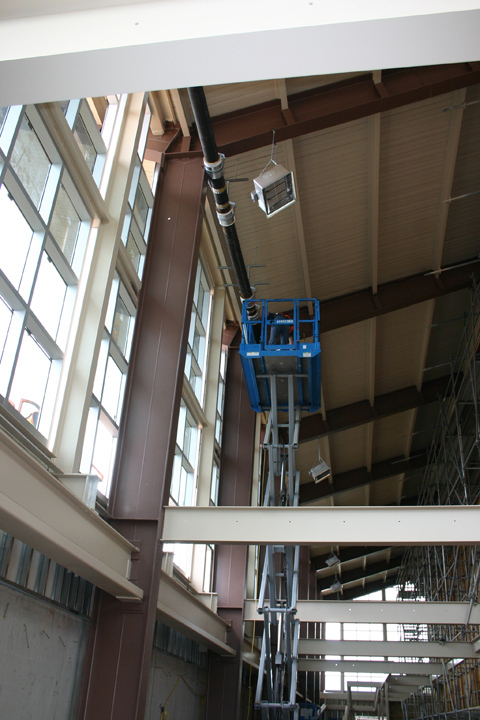 However, higher, more difficult areas are reached by a crane with a terminal basket. 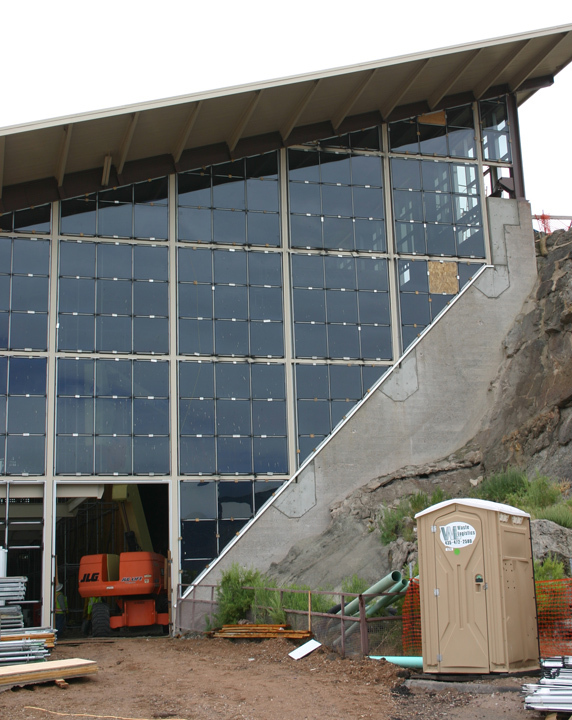 Taking this down will take less time than putting it up, but we are still looking at 2-3 weeks before all the plywood and scaffolding is down and completely outside the Quarry Visitor Center. 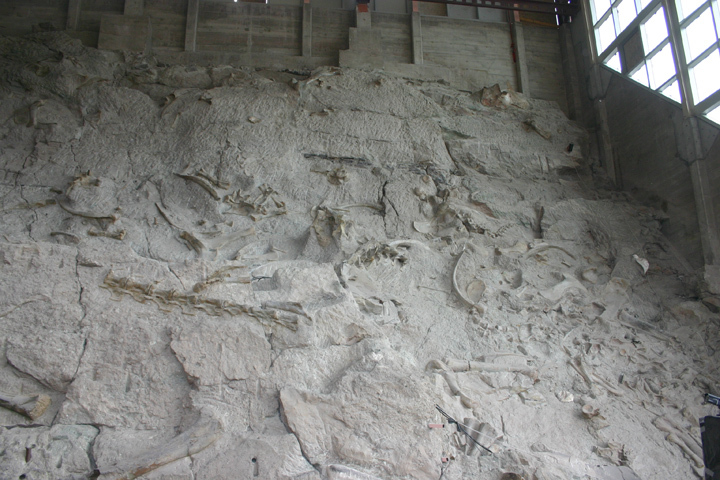 At that point all the dinosaur bones will, for the first time in 16 months, be bathed again in natural light.